With its fun bubbles and celebratory “pop,” it’s no wonder Champagne is associated with special occasions. While 20 percent of Champagne and sparkling wine sales occur in the last four weeks of the year, “bubbly,” as it is affectionately known, is not just for holidays, weddings or anniversaries. You can enjoy it year-round, and it pairs well with many different foods. 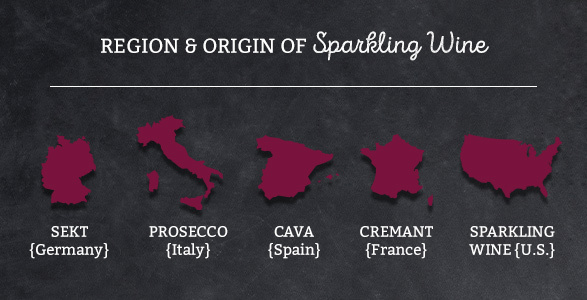 Did you know there are other sparkling wine varieties besides Champagne? Many people refer to any kind of bubbling wine as Champagne and are not exactly sure what the differences are between the two. This Champagne and sparkling wine guide will outline everything you need to know, including different types, production methods and regions of origin. Is Sparkling Wine the Same as Champagne? To get started, let’s set the record straight: sparkling wine is not the same as Champagne. While Champagne is a type of sparkling wine, not all sparkling wine can be considered Champagne. What is champagne, then? To know for sure, take a look at the label to find out the region from which the wine hails. These grape varieties are grown in the region’s cool and wet climate in soil that is chalky and rich in minerals. These conditions give the grapes a distinct acidic flavor that is used for the base of the wine — also called the cuvée, which is the concentrated juice that is extracted when the grapes are pressed. Most Champagnes are made from a blend of chardonnay and red grape varieties that are chosen for their characteristics such as aroma, flavor and fruitiness. While Champagne itself had already been discovered, the version we know it as today is often credited to a Benedictine monk, Dom Perignon. During the time that he was cellar master at the Abbey of Hautsvillers in France, he developed the process of blending various wines to create Champagne with excellent flavor. He was also integral in coming up with a method of keeping the Champagne bottles from exploding — using thicker bottles and securing the corks with string. It is said that he still lost half his bottles to bursting, though. As a general rule, all sparkling wines can follow the same food pairing suggestions as Champagne. While sparkling wine is indeed a type of wine, it is quite different from regular wine. Sparkling wine undergoes a second fermentation process that produces the CO2 to make it carbonated. Sparkling wine can be made from many different varieties of grapes and is not produced under the same strict standards as Champagne. Each sparkling wine undergoes a double fermentation. What differs is the location the fermentation happens, as well as several other factors such as the duration of the fermentation process and the pressure. Several production methods for sparkling wine exist, but the most common ones are the traditional method, or Methode Champenoise, and the tank method. Picking and First Fermentation: Grapes are picked when they are still on the young side to help preserve their acidity, and then they undergo the first fermentation. From there, the resulting base is combined with other wine bases into what is known as a cuvée. This is the final blend that becomes the sparkling wine itself. Adding Ingredients and Bottling: Sugars and yeast are added to the cuvée, and the mixture now becomes known as the tirage. The tirage is bottled, sealed and placed in a cool cellar, where it is allowed to ferment. Aging: Once the fermentation process starts, the wine is left to age — a minimum of 15 months for regular Champagne and three years for vintage. Riddling: After the fermentation is complete, it’s time for filtering — also known as riddling. The bottle is placed upside down so that the dead yeast cells and a little bit of the wine collect in the neck of the bottle. Disgorging: Next is disgorging, or removing the yeast cells. The bottles go upside down into freezing liquid, which creates a plug of yeast and wine in the neck of the bottle. When the bottle cap is removed momentarily, the pressure from the CO2 forces that plug out, and clear Champagne remains. Dosing: The final step in this process is the dosage — a mixture of sugar and wine, known as Exposition liqueur, is added to create the desired sweetness and to fill the bottle. Then, the bottles are corked and labeled. The tank method is the other common process, which is used for sparkling wines such as Prosecco. The process is similar to that of the traditional method, but instead of the second fermentation happening in individual bottles, it occurs in large tanks. There is also no aging process — the sparkling wine goes directly from fermentation to filtering, dosing and bottling. What Are the Differences Between Sparkling Wine and Champagne? While they are similar, there are some distinct differences between Champagne and other sparkling wine varieties. In addition to the production method, another feature that sets Champagne apart is the strict specifications under which it is made. The Appellation d’ Origine Controlee strictly controls the production of Champagne with stringent standards on how the grapes may be grown, harvested and prepared. For example, only specific grape varieties grown in specific soil conditions may be used, and they must be harvested by hand and pressed in a covered environment. Champagne may be classified as vintage, made with grapes from one particular year’s harvest, or non-vintage, made from a mix of grapes harvested in different years. Typically, only three or four vintages are produced every decade, and they are aged for a minimum of three years. Non-vintage Champagnes are held for about 1.5 years and are, of course, much more typical of the Champagne varieties you see. Since vintage Champagne is rarer than non-vintage, it also tends to be more expensive. Vintage bottles are clearly dated and marked with the vintage year. Here are some of the other main differences when considering sparkling wine vs. champagne. Can be lower quality due to quicker production methods and the quality of the grapes used. While some winemakers do use the same production method with fermentation occurring in the bottle, others use a method where the wine is carbonated in giant vats. While allowing for the large batches to be produced quickly, it does not always have the same quality. Is higher-quality due to labor-intensive production methods, the ideal climate and soil of the Champagne region and the quality of the grapes used. The production of Champagne takes a long time, from the cultivation of the grapes to the fermentation of each bottle, which can take decades. Extra Brut: This style is the driest wine available on the market due to the absence of any sugar. Extra brut wines, such as this Bellissima Zero Sugar Sparkling, contain between zero and 6 grams/liter of sugar. Brut: Brut champagne is dry and contains very little sugar. It is the most common designation for French sparkling wines, but brut sparkling wines possess a wide variety of different flavors and qualities. Brut wines, such as this Domaine Chandon Brut, contain between zero and 12 grams/liter of sugar. Extra Dry: Extra dry sparkling wines actually taste slightly sweet, due to the small amount of sugar they possess. This is a common designation for many American sparkling wines. Extra dry wines, such as this Domaine Ste Michelle Extra Dry, contain between 12 and 17 grams/liter of sugar. Sec: Sec wines are dry and noticeably sweet. Sec wines contain between 17 and 32 grams/liter of sugar. Demi-sec: Demi-sec wines contain an ample amount of sugar and are considered sweet without being overly so. They are the only types of sparkling wines that pair well with desserts — think wedding cake. Demi-sec wines, such as this Veuve Clicquot Ponsardin Demi-Sec Champagne, contain between 32 and 50 grams/liter of sugar. Doux: These are the sweetest wines and are considered dessert wines. Doux wines contain between 50 grams or more per liter of sugar. Blanc de Blanc: Literally meaning “white of whites”, this type of sparkling wine is made solely from Chardonnay grapes. These sparkling wines, such as this Villa Sparina Brut Blanc de Blanc, are light and clean and pair well with most foods, especially meats such as chicken and steak. Blanc de Noir: Literally meaning “white of blacks”, this type of sparkling wine is made from dark Pinot Noir and/or Pinot Meunier grapes. Blanc de Noirs, such as this Pehu Simonet Brut Blanc de Noirs Grand Cru, is a rich wine, containing notes of vanilla and berries that pairs perfectly with hard aged cheeses, Thai food and sweet fruits. Cuvee: While the term “cuvee” often refers to the first pressing of Champagne grapes, the meaning is a little different when seen on a wine label. Cuvee wines, like this Mumm Napa Cuvee M, are specially blended vintage house wines that are aged longer than others. They usually have a unique flavor and a higher price tag. Rose: Although many people associate rose’s pink color with sweetness, this pink-hued wine is usually dry with fruity notes. Created by blending in red wine or by allowing the dark grape skins to contact the clear grape juice, rose wines, such as this Mumm Napa Brut Rose, vary in color and flavor and are ideal for aperitifs or in brunch cocktails. Sparkling wine should always be served well-chilled and never at room temperature. A temperature of 45 and 50 degrees Fahrenheit is ideal. Store the bottles in the fridge for up to two hours — the exact time depends on if they are at room temperature or already slightly cooled. If you need to chill them quickly, you can put the bottles in a bucket filled with ice and cold water and leave them for about 20 minutes. To open the bottle, twist off the wire basket cap while carefully keeping a hand over the cork. Be sure to point the opening away from others, as the cork can sometimes pop off once the cap is off. Carefully ease the cork out by gently twisting it back and forth. Sparkling wine is best served in champagne flutes, whose tall and narrow shape serves to channel the bubbles over your palate. Tilt the glass while pouring so the wine pours down the side and allow the bubbles to settle before filling so it doesn’t overflow. Store unopened bottles of sparkling wine in a dark, humid place that’s between about 53 and 57°F, with the bottle on its side. If stored properly, sparkling wines can last anywhere from three to 10 years — or more if unopened. Budget: Champagne costs more than other types of sparkling wines, but many high-quality sparkling wines are grown with the same grape varieties, using the same methods, just not in the Champagne region. Keep in mind that vintage bottles cost more than non-vintages, with vintage designation not necessarily equating to better quality. No matter what you choose, you’re sure to find a delicious option that fits into your price range. Quality: The quality of Champagne is unmistakable due to the rigid growing and production standards and the specific grape varieties used. You can also find many higher-quality sparkling wines that are produced in the same way, only in different regions. Sparkling wine produced using the traditional method is usually higher in quality than those produced using the tank method. Purpose: When buying a bottle of bubbly, consider how it will be used. If you plan to mix it into juice or other cocktails, you may want to stay with a less expensive sparkling wine. However, if you plan to drink it on its own and flavor is a priority, consider purchasing a higher quality sparkling wine or Champagne. Flavor: Keep in mind the different flavor designations sparkling wine can possess and the types of foods with which they may be paired. Brut or extra brut wines will be dry and crisp, while those designated as sec will be sweeter. If you’re unsure about what type of flavor your guests will enjoy, it’s best to choose one that is not too dry or too sweet. Occasion: Champagne has a prestige unlike any other sparkling wine. Less expensive sparkling wines can be used for informal events. If you’re buying a bottle as a gift for a very special person or occasion, go with the Champagne. Sparkling wines are fine for a casual brunch, while the celebration of an engagement, wedding or new baby or gift for your boss may call for a more prestigious bubbly. 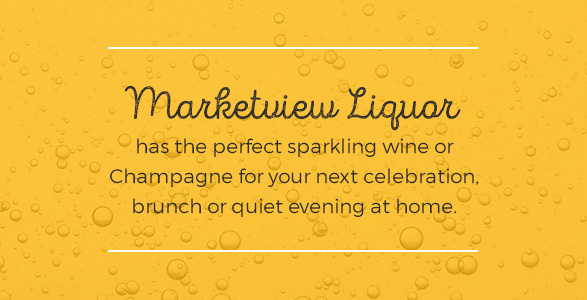 Marketview Liquor has the perfect sparkling wine or Champagne for your next celebration, brunch or quiet evening at home. We are proud to offer the greatest selection, service and savings every day on sparkling wines for morning mimosas to elegantly packaged bottles of Champagne, perfect for gift-giving. We even offer discounted mix or match by the case Champagne and sparkling wine options – perfect for your next event. Browse our extensive collection of Champagne and sparkling wines and be ready for your next toast-worthy event or dinner. Even better, have it shipped to you directly! This entry was posted in Wine by marketviewblog. | Bookmark the permalink.